"...this extensively reworked 'Carrie' has been presented in the best possible taste." "Stafford Arima's production is indeed cohesive. It uses few props and Impressionist video projections that call to mind the artwork of Edward Gorey or the style of Lemony Snicket." "...this 'Carrie' has real weight and emotional conviction, and it engaged me more than a lot of musicals I've seen lately. On Broadway these days, being facetious is easy... Being serious is the real daredevil challenge. The few musicals that succeed at it...usually protect themselves from ridicule by setting their stories in distant times and places. 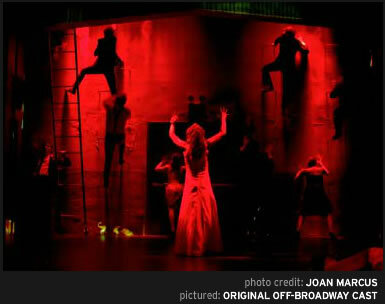 'Carrie' tries to turn ordinary, all-too-familiar high school angst into the stuff of tragedy. The show has guts." "Stafford Arima wisely keeps the focus on the emotional heart of the story." "Now the most infamous of all such corpses...has been reanimated by director Stafford Arima for MCC Theater. And the most shocking thing about it is how well it works." "Eschewing easy irony, the director, Stafford Arima, has dug deep for the pathos in Michael Gore and Dean Pitchford's score... As fate irrefutably proved, 'Carrie' was never meant to be a Broadway spectacle. 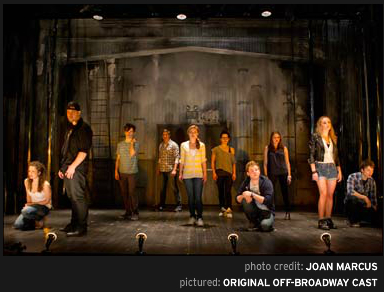 All these years later, let's welcome it back in its proper form: Off Broadway cult curiosity." Best Musical Revival award from the Off Broadway Alliance.